Decades of self-help volumes have spent pages and pages on saying here’s THE answer; do what we say and It All Gets Better. And while what they suggest may be right for some people, it’s never right for everyone. If you’re tired of authors telling you what to do, be or have without taking into account who YOU are to begin with, this is your book. 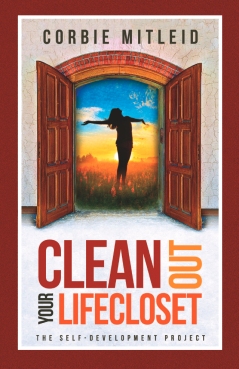 Clean Out Your LifeCloset encourages you to write your own story of change based on your history, your life experiences, and your personal goals. Author Corbie Mitleid is your guide and mentor, accompanying you on your journey. Discovering how to “get clear” on your purpose, your relationships, and your connection with Spirit allows you to simplify your life, learn the delights of going with the flow, and actually make friends with Stress, that 21st century constant companion. Through stories, examples, and her unique “Adventure Pages,” you can find your own answers, design your own toolbox, and discover that healing the old and creating the new can be a positive, joyful and soul-satisfying experience. Mitleid channels her experiences as an intuitive consultant, teacher, and cancer survivor into this motivational self-help guide, the first of three volumes in a series. Divided into four parts, this debut work announces in the preface its ultimate goal: to encourage readers to use the advice in the way that suits their needs best. The author makes “suggestions, but they are just that—a suggested road to self-study.” The four main areas include achieving clarity, simplifying life and living with less, learning to adapt, and managing stress as a growing tool. The author’s personal trials, career, and relationships are woven through each chapter, ranging from her battle with breast cancer to her divorces to her work as an intuitive consultant. As a psychic, Mitleid notes that she was asked countless times to identify a client’s “life’s purpose,” emphasizing that there are no shortcuts to discovering this. Individuals can only do that for themselves through hard work and introspection. Writing exercises are included at the end of each chapter, with a special “Invention Page” to allow more creative, abstract interpretations of the text through drawing, collage, etc. Having a clear focus on what one truly wants out of life is an important, unifying theme throughout. With a funny, straightforward, and nonpreachy tone, this work stands out from other self-help guides in that it is not demanding, allowing people to move at their own pace in improving their lives. The interactive questions and writing exercises at the end of each chapter are useful, clever tools to assist readers in actively and constructively processing their ideas to better understand their own personal growing process. Mitleid does not intimidate or taunt readers with unattainable goals. Rather, her book is an approachable, supportive, and unassuming manual in achieving self-actualization through growth and spiritual exploration. An inspiring work that sets itself apart from other self-help books by encouraging readers to write their own transformation narratives rather than simply providing broad, generalized answers.